Projecting markets can be difficult for executives who want concrete answers to the potential decisions they are about to make. One of the strong signs of leadership is the ability to deal with ambiguous information. This means that decision makers may not have all of the information they need to make appropriate decisions. Each decision leads to the possibility of failure with significant financial costs. The use of statistical methods can be an enhancement to the decision making process through lowering levels of uncertainty. However, statistics alone can cause mistakes and are not substitutes for good judgment. Using multiple statistical analyses to make expensive projection calls can lower decision errors and lead to stronger choices that improve market choices. The Delphi Method was developed by Olaf Helmer while at the Rand Corporation. In the method participants answer questions about predictions, products, or services while not being able to interact with each other. Afterward the results are tabulated and then put within a quartile system to supply to experts. The experts provide their opinions based upon new information and those that fall into the outlining quartiles need to justify their answers. Projections often use only expert opinions while product research may use customer opinions. The answers are then provided back to the original participants who also justify their answers. Each subsequent round creates additional consensus on opinions until there is a cluster around a single (or few opinions) that can be used to project markets. 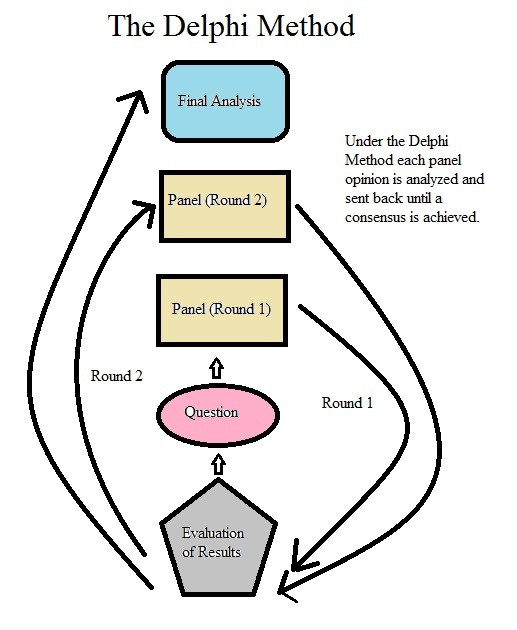 The advantage of the Delphi Method is that larger bodies of experts are likely to be more accurate than decisions made by individuals. As each person continually adjusts their answers through repeated evaluation the entire process becomes more accurate. Eventually there will be a predominant opinion that can be used in evaluation and forecasting market trends. Imagine for a moment that you are an executive and you need to make a decision about an expensive investment. However, you are unsure if the environment will be right for this investment to pay off over the next five years. To create more clarity in your thinking you poll a number of experts within the city. They respond but their answers are scattered enough as to make a prediction both risky and unlikely. You analyze the data and ask the outliers (people with widely varying opinions) to justify their positions. As you keep running this process over and over the responses will regress to a more focused answer that can be used to make decisions. The cross-impact analysis uses available data from the past to make predictions about the future. There is an assumption that past events influence future events. Typically a group of experts study correlations between events and present these within a matrix. The matrix then shows the probability from 0-1 of a particular event occurring. We can use an example of the probability that gas prices will rise if either of two events occur. The simplified example would not include all of the potential factors that would be included in a true analysis but does highlight how the process works. This simplified chart is stating that if a plant shuts down there is a 20% chance gas prices will raise. If there is a trucker union strikes there is a 30% chance that gas prices will raise. The example above would not be considered accurate as there are many more events that can be applied to a potential situation. It is used as an illustration only. An actual analysis of would also include all the potential factors, the chances of certain events occurring, and the potential outcomes when those events do occur. Such an analysis would have factor upon factor all connected together into a long probability string to predict future events. It is beneficial to put it in a chart or graph form because it can be hard for people to keep these concepts organized in their head. The cross-impact analysis was adopted by the government and business community in the early 1970’s. There are various forms of this analysis using different types of formulas and methods of denoting probability. Some models might simply use a negative or positive sign to denote opportunities. Other methods might consider “enhancing” and “detracting” factors to particular events. This analysis is based on game theory. As each opponent picks a certain avenue to gain competitive advantage there are resulting probabilities for the next choice of actions. Each action creates more probabilities. The advantage in businesses is that they can both lead their opponent’s choices as well as pick better responses once the opponent has made choices. The end goal is to increase probabilities of success while reducing the probabilities of failure. “Check mate” occurs when all of your opponent’s next choices result in their loss making the next move nearly useless. Your opponent will either end the game or pick from increasingly bad choices. In the world of business, organizations attempt to predict potential advantages and detractors in order to create proper strategy. They conduct an environmental analysis to understand all of these potential possibilities and then use a cross-impact analysis to represent and track these strategic choices. The key is to create market advantages that result in higher levels of revenue and market share. The winner is that organization that makes choices that overcome market challenges and has the highest level of sustainable growth. As you can see when the organization wins, employees win, the executive wins, and the shareholders win. The regression analysis is often used for modeling and predicting particular relationships by analyzing how the dependent variable is influenced when one of the independent variables changes. This allows researchers to see if a particular change shows a relationship between two elements. For example, if one of the independent variables is changed and this results in a dependent variable change then we have a level of influence. Moving through each of the independent variables will allow for statistical measurements showing how each factor changes and adjusts the dependent variable. It must be remembered that the regression analysis does not prove that one variable causes another variable. It can only show that there is an association between the two variables and that one has an impact on the other. Truly understanding the causal relationship would require the adjustment of inputs that recreate events within a lab or similar type of experimental setting. Some researchers become confused between causation and correlation…even though there is an important distinction. The regression analysis is a systematic method of understanding that can be used in business to understand influences of varying factors. For example, if a product is purchased more often because it is seen as red and therefore noticed by customers more often an experiment could be conducted to determine how these factors are associated. Perhaps it is the price in addition to the red color? This would require an evaluation of the various factors through the use of a regression analysis. The regression analysis first appeared in the literature by Legendre in 1805 as a method of least squares to understand orbits around the sun (Legendre, 1805). The term “regression” was later used by Francis Galton to understand how tall people appear to regress in preceding generations down to the average of human height. 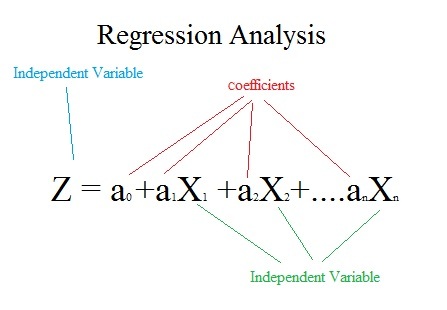 Today the regression analysis is a major statistical method of understanding and analyzing association of factors in research. Dalkey, N. & Helmer, O. (1963). An experimental application of the Delphi Method to the use of experts. Management Science, 9 (3). Legendre, A. (1805). Nouvelles méthodes pour la détermination des orbites des comètes. Firmin Didot, Paris.